We are saddened by the horriffic events in two Mosques in New Zealand. We stand with all others in solidarity against all forms of hate, racism, and terror. 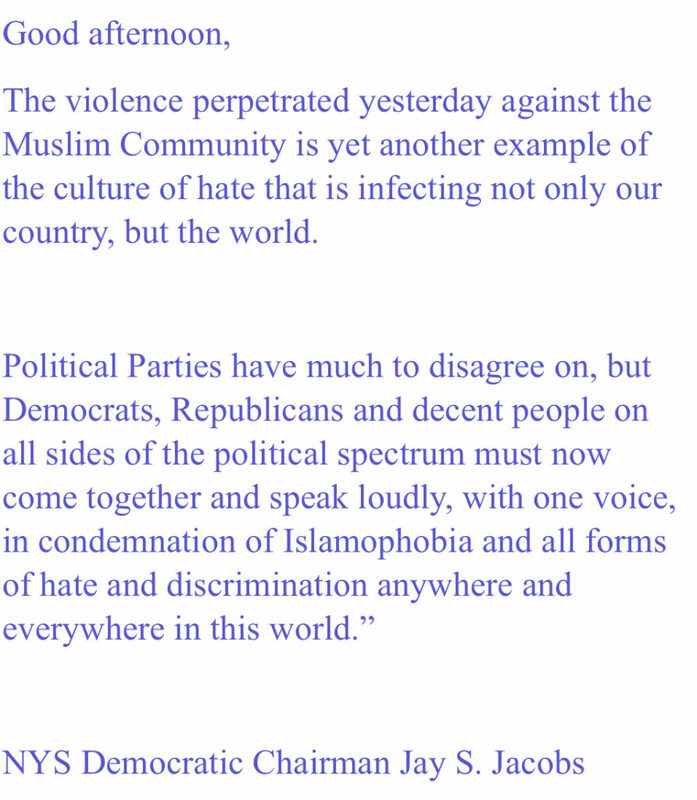 New York State Democratic Chairman Jay S. Jacobs shared the statement below on the New Zealand Mosque Massacre. Tickets now available through March 26th online or you may give a check. We hope you are staying warm as we begin a very chilly March! March 9 Saturday noon p.m. 16th St & First Ave.
March 11 Monday 4:30 p.m. D’Ags Supermarket, 25th St and Third Ave.
March 13 Wed. 5:15 – 6:00 p.m. Starbucks 23rd & First Ave.
Tickets now available through March 26th online. It is with deep sadness that we note the passing of James McManus. He was a dear political friend and we will miss him greatly. We are co-hosting our membership meeting with our sister club ERDC. Julie Menin, NYC’s Census Director will be speaking about Census 2020. Our membership can meet after her talk to discuss club issues. A reminder, Tilden officer elections are this month! NYU Dental, 345 E. 24th St at First Ave. 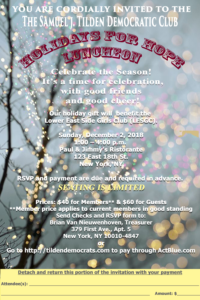 Assembly Member Harvey Epstein (74th AD) will host a town hall to discuss his 2019 legislative session in Albany, along with issues such as housing, education, electoral reform and disability rights. We hope you have a wonderful 2019! A few dates to note: Tilden is co-sponsoring two Public Advocate forums. Invited Candidates in the attached flyer. Tilden officer elections are this month! We hope you’re enjoying this season whichever way you celebrate. We hope you have a wonderful Thanksgiving with family and friends!